No movie franchise has been more important to the hobby than Star Wars. Topps has been producing Star Wars trading cards since the first film was released in 1977. Since then, dozens of different sets have come and gone. Because Star Wars cards have been around so long, it's possible to track much of the hobby's evolution through these sets as well. They began as something simple: cards, sticker, gum. Then came inserts, followed by autographs, sketch cards and, finally, costume relic cards. 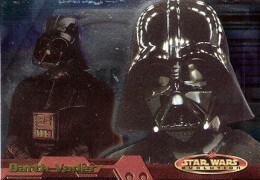 Check out our ever-growing database of Star Wars trading card sets. With such an expansive universe to choose from, Topps has kept the Star Wars line relatively fresh, even after more than three decades. Even still, some sets stand out more than others. Keeping that in mind, here are the ten best sets of Star Wars trading cards released between 1977 and 2012. While there have been many international sets through the years, we have limited this list to sets made by Topps for North American distribution. In addition, more modern releases have been left off to allow the time required to properly evaluate their place among the sets. 1996 Topps Star Wars 3Di takes the Widevision format they introduced the previous year and gives it some added depth -- literally. The set is done entirely in 3D. A high initial cost likely contributed to a low print run. This has led the set to stand up extremely well on the secondary market. Even commons command more than a dollar each. Should you open a box, be sure to take the card off the box. These are blank back variations many collectors still chase today. After years of being one of the most popular brands in sports cards, Finest found itself in a new relationship in the mid-90s. 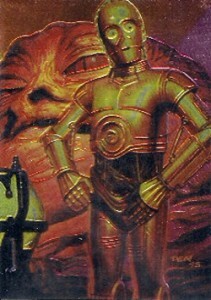 1996 Topps Star Wars Finest keeps the hallmark chromium look that collectors expect. The 90-card set is broken down into several themed subsets, each illustrated by a different artist. The checklist goes beyond the films, adding characters from the expanded Star Wars Universe as well. Like in sports, Refractor parallels are the most popular inserts in the set. So something positive actually did come of Attack of the Clones. Like previous Widevision releases, the base set does a great job of capturing panoramic shots from the movie itself. But that's not the main reason this set stands outs. It's the autographs. With 36 packs per box and autographs combining to fall 1:24 packs, there's a good chance collectors of getting two in a box. All are on-card and have plenty of space for even the biggest signatures. 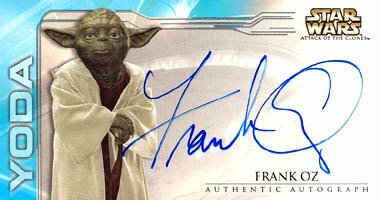 To date, 2002 Topps Star Wars Episode II: Attack of the Clones Widevision is the only place to find a certified Frank Oz (Yoda) autograph. The third set since the Star Wars Galaxy line was relaunched in 2009, there was a fair bit of collector apathy aimed at 2011 Topps Star Wars Galaxy 6 prior to its release. But when it arrived, the set exploded. Although just one sketch card was promised per hobby box, most came with two. 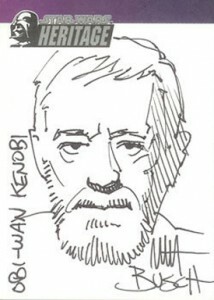 The quality of the sketch cards is also notably higher than some of the other sets. 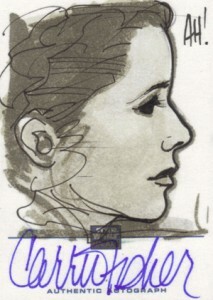 Also new to the set are Sketchagraphs, which have an actor's autograph on a sketch card. And being a Star Wars Galaxy set, the base set artwork is phenomenal. 2001 Star Wars Evolution is a character-based set. Every base card is done in foil to give it a unique look alongside the dozens of other sets for the franchise. However, the biggest reason this set is so popular is because it was the first to include actor autographs. Falling one per box, the checklist is one of the biggest for a Star Wars set. Key signatures include Carrie Fisher, Anthony Daniels and Ian McDiarmid. 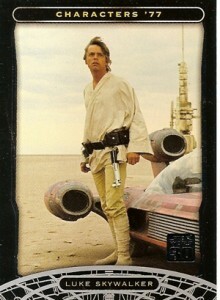 2004 Topps Star Wars Heritage brought back the designs and feel of the trading cards from the original trilogy. The 120-card set focuses mainly on the first five films in the franchise. It also has the first cards of Episode III: Revenge of the Sith. 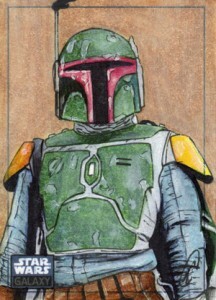 More importantly, the released introduced sketch cards to the Star Wars Universe. Compared to today's high standards, much of the art seems very simple and not the most desirable. However, there are lots of detailed pieces out there too. 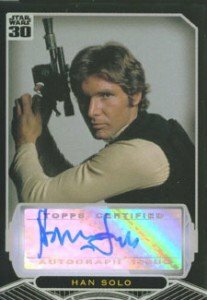 2004 Topps Star Wars Heritage also has limited autographs of Mark Hamill, Carrie Fisher and James Earl Jones. For something like Star Wars, the look and feel of the image is extremely important. Early sets for the franchise used low-quality materials. Also, the card dimensions required images to be cropped. 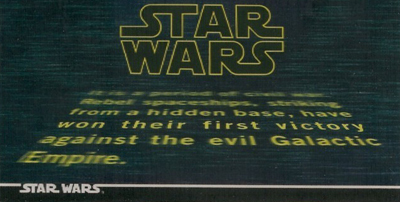 1995 Topps Star Wars Widevision gave the movie the upgrade it deserved. Using a tall boy format, the entire image is able to make the move to a trading card. The result is some of the most attractive Star Wars trading cards to date. Topps quickly turned around similar sets for The Empire Strikes Back and Return of the Jedi. 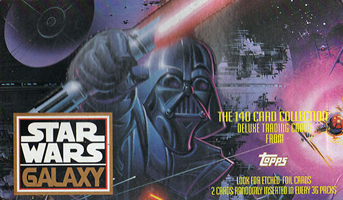 When 1993 Topps Star Wars Galaxy Series 1 was released, the franchise was just starting to emerge from a long slumber. The art-based set was unlike anything collectors had seen from a Star Wars set before. 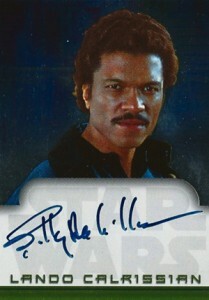 That said, it was also the first set of Topps Star Wars trading cards since Return of the Jedi was in theaters. It had to begin somewhere. No Star Wars trading cards are more cherished and remembered than the ones that started it all. Between 1977 and 1978, Topps released five different series of Star Wars cards, each building off the last. Today, the technology is crude. Many of the images are blurry. But there's power in nostalgia. 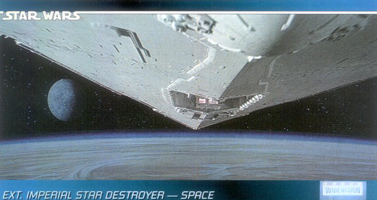 And without Topps getting in early, it's possible the Star Wars trading card landscape could be much different. Three decades of Star Wars culminated in one epic set that mixes the classic feel of the original trilogy with the demands of the modern hobby. The 120-card base set covers not only all six films, but many of the off-shoots as well. Even the notorious Star Wars Holiday Special gets some love. Every box delivers either an autograph or a sketch card. The autograph checklist is the best ever, delivering several key cast members including the elusive Harrison Ford. Iconic composer, John Williams, is also part of the autograph checklist. As a bonus, every box has a foil stamped buyback from the original 1977 cards. These proved to be extremely popular as well on the secondary market as a handful of collectors clamored for a complete set. What's your favorite Star Wars set? The only ones I know of are the Episode I Widevision cards. Great list, I wouldn’t argue with any of them, and while I know it’s not by Topps, I’d still like to give a shout out for an honorable mention to the 1977/78 Wonder Bread set. A nice selection of 16 cards with excellent character selection, distinctive black borders, and sharp photography. These really whet my appetite for the Topps cards as I remember seeing the bread and cereal premium cards first. The Hildebrandt Brothers illustrated “Shadows of the Empire” is also a teriffic set from Topps. Rudy (ID 64426) � Those are great sets too. My one personal beef with Shadows is that the “inserts” are in the middle of the base set. I like full sets and this one forced me to go after inserts. I really need to focus and pick up the last couple I’m missing. I just received the 1977 Star Wars Topps blue card through ebay. I’m overwhelmed becouse I had them when I was little and now have them again. I’ve bought them in Australia. 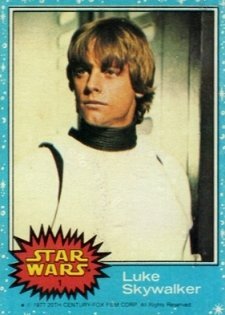 I have a doubt Ryan and that is I see a few cards are not sharp in image, like card number 57 “Mark Hamill as Luke Skywalker” and a few others. Is this normal? Do I have an imitation set??? Ha ha …I’m just a little paranoid. Carlos � It is a great set. You should be fine. Production values weren’t so high back in 1977. Also, because singles don’t usually go for more than a few dollars, counterfeits haven’t been a known issue. 1977 Divenpress paper venezuelan color and spanish back cards. Never seem in USA and almost impossible to find. PERIOD. The complete original series Topps boxed sets are getting SO expensive! should i open unopened packages of wide-vision Star Wars cards? Hello I have had some Star Wars cards left to me but the collection is not complete. I believe that 24 cards are missing of 80 for Tops widescreen Episode One.These cards are in excellent shape with a plastic sleeve over each one.I would like to have someones opinion on the value of these cards and were i might be able to part with them. Where is the 2012 & 2013 Star Wars Galactic Files Sets? The most comprehensive Star Wars sets ever produced and it doesn’t make the list! I need to talk to a collector because I have all of the 1977 & 78 Star war’s movie cards and I have everything and everyone have had since 1977 when I was 5 Yrs old and I honestly have Luke Darth Vader c 3 Po every part of the movie is shown on each card that I have hope to talk to a serious collector ASAP I am sitting on a gold mine 765-469-7198 Call me .